The three Wairarapa Councils and waste management contractor Earthcare are encouraging residents to minimise waste these holidays and remember the two-recycling crate rule. The current arrangement between all three Wairarapa Councils and Earthcare is to only collect two recycling crates from each household within the collection area until wheelie bins are introduced in mid-2019. Wheelie bins will increase urban kerbside recycling capacity by 50 percent. Wairarapa Zero Waste coordinator Jo Dean says this is a great time of the year to reinforce the positive message of waste minimisation. 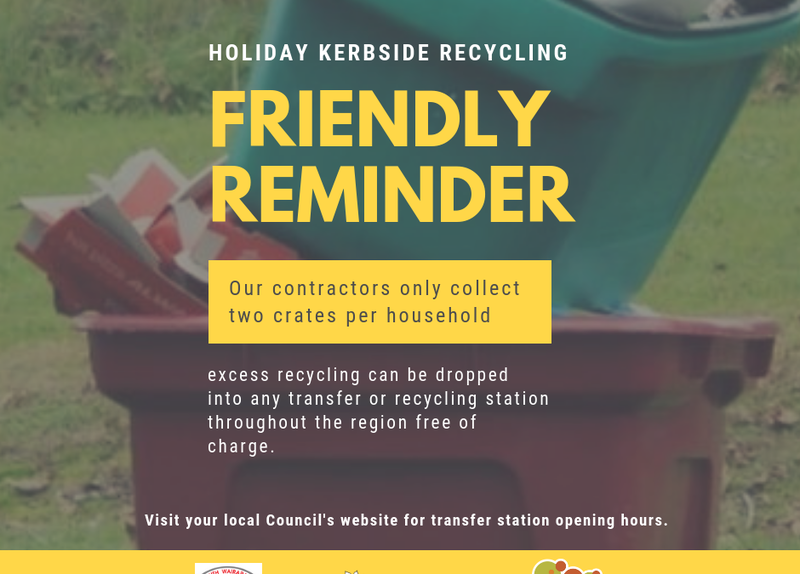 This reminder comes following a busy 2017/18 holiday period, where contractors had to work extra hours to collect excess kerbside recycling. Solving this issue resulted in Councils asking the contractor to tighten up on the two recycling crate rule. Ms Dean encourages residents to start planning now towards a zero waste holiday period. Although Ms Dean’s role is to encourage waste minimisation, she understands that even with the best intentions households will still be facing excess volumes of waste and recycling at this busy time of year. For transfer and recycling station hours, please visit your local Council’s website.